A glimpse through the veils separating this world from the next. How do you begin to investigate whether there’s an afterlife, a beforelife by way of reincarnation, a limbo state by which the dead walk among the living, and so forth? Insisting that her intriguing though ultimately unconvincing project is a journalistic account, Kean (UFOs: Generals, Pilots and Government Officials Go on the Record, 2010, etc.) heads off to talk to the psychics. “To locate them, I checked with two respectable organizations that run certification programs for mediums,” she writes. Respectable? That’s a value judgment—and just how does one certify a medium, anyway? The author dutifully explores the ethereal realms, looking into out-of-body and near-death experiences, “intermission memories,” apparitions and auras, and the like. The whole enterprise is garbed in a sort of science-y mantle, replete with terminology along the lines of “living-agent psi” and “materialization.” Mostly, Kean’s argument is one of assertion; as one of her like-minded contributors puts it, “I am now ready to say that we have good evidence that some young children have memories of a life from the past.” Unfortunately, that good evidence is not forthcoming, and in any event, as the same contributor notes, children who express these memories tend to be “very intelligent and very verbal,” which might lead a skeptic to conclude that such stories are inventions of the imagination. 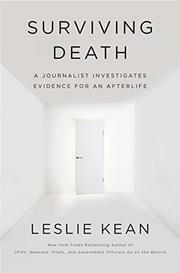 In the end, Kean’s case proceeds on touchy-feely grounds (“these feel so clearly external to me, that I am compelled to allow them that reality”) without much in the way of actionable proof: it’s certainly not science, and it’s not really journalism, either. Those given to believe in ghosts, heaven, and white lights will find this a fine example of confirmation bias, while those who are not will not be swayed.